Robert Deyber Artist Signed Limited Edition Hand-crafted Stone Lithograph:"Any Port in Storm III"
Robert Deyber's artwork is full of surprises. Every canvas revels in the artist's sense of humor, each painting a visual rendering of a clever turn on a common phrase. Despite his sense of fun, however, Robert Deyber is a seriously skilled painter. He is endlessly intrigued by visual imaginings that reside in the realm between reality and fantasy, and he is clearly able to render these imaginings brilliantly. His artwork is highly narrative in nature; his paintings convey an almost dreamlike quality to the bemused viewer. Born and raised in Greenwich, Connecticut, Deyber began drawing at an early age. Art was a necessary means of escape from an otherwise difficult world, one in which he set his mind free to visit the most remote places-a wheat field in South Dakota, the dunes of the Gobi desert, the moons of Jupiter-all within easy reach for a very imaginative young boy. Throughout his paintings, Robert Deyber moves in and out of visual themes and story lines. Compelled to create imagery where he uses a combination of highly stylized composition, light and contrasting colors, his goal is to apply all three skillfully, thereby drawing the viewer into his painting without overpowering or confusing. Deyber is a �visual raconteur'-a storyteller with a paintbrush, his mind's eye planted deep within the subconscious. 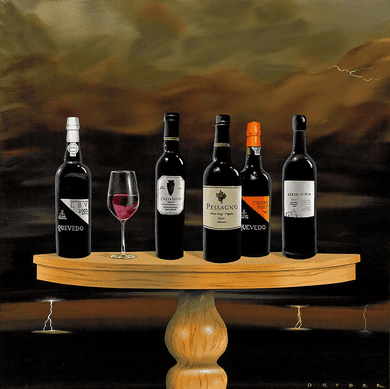 With artistic roots that hail from the Surrealist movement, among his heroes are Rene Magritte and Salvator Dali. While many of Deyber's paintings contain elements derived from dreams created out of the unpredictable imagery found in the subconscious, the extraterrestrial flowers have more in common with the worlds of alternate natural history imagined by Alexis Rockman or Walton Ford, and the visual rendition of current phraseology and popular culture are more in the tradition of the Pop Art movement. It is, in the end, the undecided tone between sincerity and irony that makes Robert Deyber's artwork distinctly contemporary, his visual vocabulary distinctly his own, but with a worldwide audience. Deyber collectors transcend all traditional boundaries. Private and corporate collectors throughout the United States as well as throughout Europe and Asia have acquired Deyber's paintings. His work has strong appeal and continues to be collected by many in the entertainment industry, including independent film producers, well-known screenwriters and designers.